Market is now OPEN for Saturday! 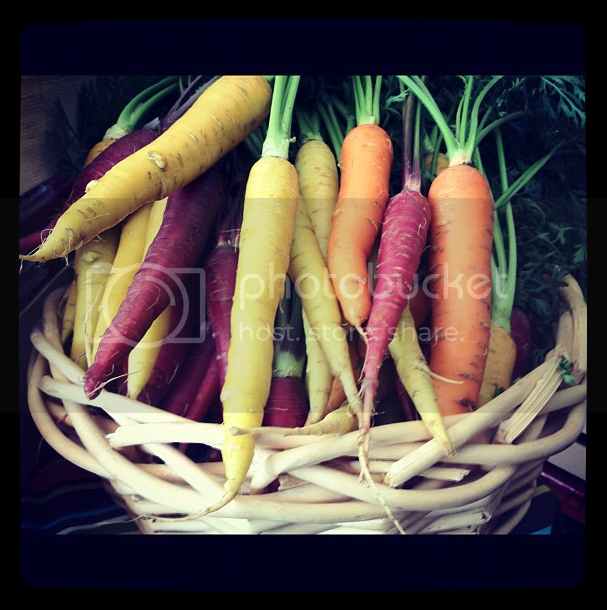 Heirloom Carrots and Spring Onions available! Mitch Blumenthal acquired a ten-acre organic blueberry farm in 1995. As he tended to his Sarasota crop, he began to explore heirloom row crops, blackberries, and other unusual items. Soon, the ten acres of blueberries had evolved into ten acres of diverse, beautiful crops. This week we have heirloom carrots and spring onions with tops available from Bluemenberry Farms. You can order them here! Our assistant operations manager Leore is leaving us to start a new chapter in her life. We’re going to miss her playing Otis Redding and that big smile! We wish you the best! Place your order before Friday at 9am for pick-up or delivery on Wednesday. Market is OPEN for Wednesday! 20% off all produce in the store! — This does not include shelf items or meat. Pickup is from 2-8pm on Wednesday. Sorry, we cannot accommodate early pickups. Market OPEN for Saturday! Price drops! My fresh vegetables and herbs are all grown outdoors in the ground in natural sun, wind and rain. As a result, they may not always be picture-perfect, but the flavor and nutrition levels can’t be beat. Vegetable seedlings are grown in the same outdoor conditions, producing a sturdier transplant than commercial greenhouse-grown varieties that collapse when exposed to real-world conditions. -Apopka Foliage & Fresh Market on the first and third Saturdays of the month (Oct-May) Both plants & some produce. -Sanford Farm Swap meet on the second and fourth Saturdays of each month. Mainly plants and some seasonal fruits. -Orlando VA Clinic Farmers Market on the first and third Wednesdays of the month (produce only). The Online Market for Wednesday is now Open! Indian River Garden Company believe in safe, non-toxic environments along with nourishing the body inside and out. We practice traditional methods of preparation for our fermented and cultured products. We realize many humans are gluten intolerant and would like gluten-free ORGANIC options. We make every attempt to assure there is no GMO is anything we produce. We make every attempt to either grow our own organic ingredients or to source only organic with preference given to local sources where possible. This Monday, March 11th members only special is in! Members will receive 15% off all citrus available in the Farm Store! Including Ruby Grapefruit, Navel Oranges, Tangerines, and Lemons! Pickup is from 2-8pm on Wednesday March 13th. Sorry, we cannot accommodate early pickups at this time. Mitch Blumenthal, founder and owner of Global Organic Specialty Source, began as an organic farmer in Sarasota, Florida. As Mitch sought out other organic fruits and vegetables for his family beyond what he was cultivating on his Blumenberry Farm, he realized that an opportunity existed for an organic-supply company. Our employees keep Global Organic Specialty Source running 24 hours a day and 365 days a year to bring you the best quality organic produce at a price you can afford.2007 saw the addition of a new room for Global Organic Specialty Source’s large overwrap program, and our new custom repack label, Noah’s Organic Garden. Over eighty people work together, 24 hours a day, 365 days a year, to make sure that you receive the best quality organic produce available—at the right price. We thank all of our current customers, growers and employees, and welcome those of you visiting our site. We look forward to starting a relationship with you! From the left: Jim Costello, Director of Sales, Mitch Blumenthal, Prez/Owner, George Caldwell, Director of Purchasing and Christian Garcia, Sales Associate. Check Sunday’s Weblog for next weeks Member Monday special. Pickup is from 12-7pm on Saturday February 30th. Sorry, we cannot accommodate early pickups at this time. Place an Order now for Wednesday's Market! This Monday, March 4th members only special is in! Members will receive 15% off the Purchase of an assortment of tomatoes available in the Farm Store. Pickup is from 2-8pm on Wednesday March 6th. Sorry, we cannot accommodate early pickups at this time. Saturday's Online Market now OPEN! Monterey Mushrooms, Inc. was established in 1971 as a family- owned and operated farm in Royal Oaks, California. Today, Monterey is vertically integrated and able to control all aspects of mushroom production from seed to customer/consumer. An international, multi-facility company, with 10 mushroom growing farms strategically located throughout North America – Monterey’s mushrooms are literally “locally grown” nationwide. This means that Monterey is uniquely positioned to deliver the best, most innovative mushroom products possible to consumers throughout the country. For us here in Central Florida, we are lucky to have one of Monterey Mushroom farms right in our backyard. Located in Zellwood, the Monterey Mushroom farm of Central Florida grows big beautiful portabellas and white button mushrooms. This facility used to be Certified Organic, but does not currently carry that label due to the loss of a big contract with Publix a few years back that made the $10,000 annual certification fees un-feasible for their business. The name TANGIE is inspired by my dad, Terry Tremblay. He believed in recycling and repurposing whenever possible and spent his entire working career doing just that all along encouraging me to do the same. Most of my working life involved law and finance which did not always mesh with my core beliefs. The corporate giant is not very good at reusing or recycling anything, especially paper! In my world, we reuse every piece of paper, letting the worm composter have it last. We repurpose what we can, use travel mugs, cook many meals in the Sun Oven, drive a Prius, make our own laundry detergent and all the household cleaners we need. In 2008, I had the opportunity to develop my line of homemade cleaning products into a real business. I had been using these ingredients and “recipes” for years with great success. The world is filled with toxic, petroleum based cleaners that harm us, so we took the chance to start Tangie and share what we know about cleaning better with less. We are very proud to say that this line is safe for everyone….people, pets and the environment! Trademarking the name TANGIE came this year (2012) and I continue to develop additional products are free of petroloeum, phosphates, harsh chemicals and animal testing or animal by products. TANGIE products will only contain only the best medical grade esssential oils, natural soaps, distilled vinegar and other biodegradable ingredients that are 100% effective! Thank you for joining me in making a conscious choice today to save our planet. Pickup is from 12-7pm on Saturday February 23th. Sorry, we cannot accommodate early pickups at this time. Wednesday's Online Market now OPEN! Items available from Escentual Harmony Soaps can be found at the Farm Store! Tomorrow members will receive 25% all Greens purchased in the Farm Store. Including Kale, Chard, Lettuces and more! Pickup is from 2-8pm on Wednesday February 20th. Sorry, we cannot accommodate early pickups at this time. New Producer! Market OPEN for Saturday! Cleaning products are some of the most toxic products we have in our homes. They are made with synthetic chemicals that are dangerous to our health, hurt plants and animals when we wash them down our drains and they create unnecessary hazardous waste. They came on the market about 60 years ago when chemists discovered we could create hundreds of different chemicals with petroleum oil. Petroleum was cheap, worked well in cleaning products and companies began marketing these products mainly to women as a way to make the job of cleaning faster and more efficient. The good news is that it doesn’t have to be that way. There are plenty of natural, eco-friendly ingredients that clean just as well as their chemical counterparts. I spent a year developing my formulas because I wanted to come up with cleaning solutions that worked really well, were completely safe to use and also looked and smelled great. I tested every surface, every scenario, cleaned my friends’ houses and spent every waking moment tweaking and re-tweaking my formulas until I was confident in the final product. What I came up with are five products that are multi-purpose so you can use them to clean your entire house from top to bottom, inside and out. No more lugging around tile cleaner, toilet cleaner, kitchen cleaner, surface spray, bathroom cleaner and all the other products that are jumbled together underneath your sink. Just 5 great products that can tackle anything. I carry mine around in a 6-pack holder, with a cup in the extra spot to carry my tools, like an old toothbrush and sponges, and it really makes the sometimes disgusting job of cleaning a little more bearable. I package them in beautiful bottles that are designed to be reused or refilled once they’re empty so we can cut down on the waste we create and the liquid refills are packaged in recycled (sterilized) water bottles that I collect from friends. In fact, I collected so many bottles that I’ve filled up an entire room in my house! You can see a picture here. So that’s a little bit about how Mrs. Jones’ Soapbox came to be. I hope you’ll give it a try. I think you’ll find it makes the chore of cleaning a little more fun and lot more healthy. Thanks for stopping by! Pickup is from 12-7pm on Saturday February 16th. Sorry, we cannot accommodate early pickups at this time.